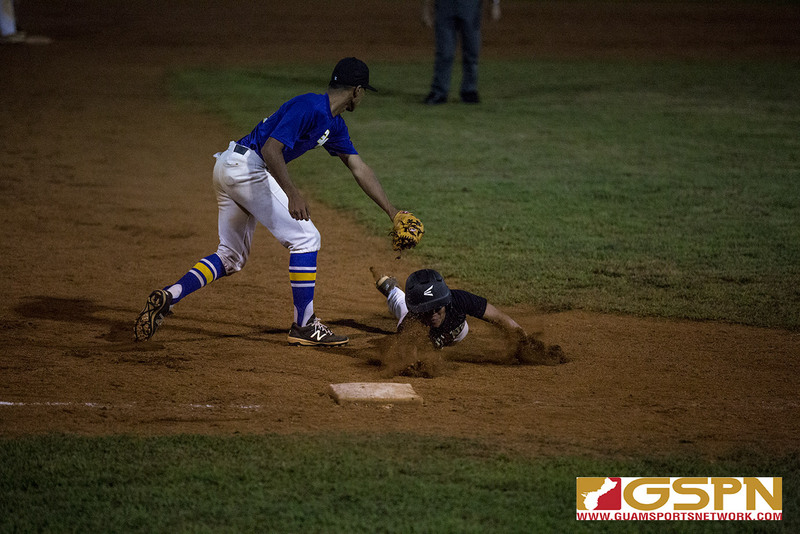 The first two innings of the GW Geckos and Tiyan Titans IIAAG baseball semifinals game featured a total of 24 runs. The hot bats set the tone, but defenses would prevail in the later innings as the Geckos toppled the Titans 19-11 at the Paseo Stadium to propel them into what will be their fourth-straight finals appearance. Playing in what would be the last game of his high school career, Gecko Athan Yatar earned a tough win and pitched the entire seven innings while striking out 10 batters. Although he wasn’t happy giving up nine runs in the firs two innings, Yatar took it upon himself to get the team in the right head space. “I pitched my heart out knowing this was going to be our last game today and I think that was the game changer. Everything started with me so I better have brought it. This was one of my bad days, but we got the ‘W’ and that’s all that matters,” said Yatar. Yatar will be in Japan during the title game, but said following every step of the way. GW had their biggest lead of the contest midway through the 2nd inning as ‘Mighty’ Joe Young smacked a two-run double to keep GW in the drivers seat up 15-4. The blazing start to the contest was all about rhythm and feeding off of each others energy. “When one person gets it going, all of us start rallying behind him. Hit by hit, pitch by pitch, it was all us today,” said Young. With GW now set for a title defense against the FD Friars who had beaten them twice this season, the Geckos are anything but nervous. “We dug deeper and our heart showed all on the field today. I have faith in my team and I trust them. I believe we can win this championship and I’ll be tuning in; these are my boys,” said Yatar. Titans starting pitcher Javier Lujan had a nightmare start to the game as he quickly found himself with loaded bases with no outs after three Gecko hits. Lujan walked in the first run, and Ethan Cali added one more with an RBI single at his first at bat. An error by shortstop Isaac Ignacio put Tiyan in a 3-0 hole, and Gecko Koby Pocaigue sent his shot through the legs of Ignacio a batter later to put GW ahead 5-0 in the blink of an eye. Yatar gave the Geckos a 7-0 lead off a sac-fly, ending Lujan’s day at the mound. Mark Laanan took over with Tiyan giving up a run off a pass ball for a quick 8-0 1st inning rut. The Titans responded in the bottom of the 1st inning with sticks of their own as Ignacio brought in Tiyan’s first score. Kobe Quiambao hit a shot deep left for an RBI double to inch the teams way back, still down 8-2. A sac-fly from Coby Gogue gave Titans fans plenty of hope, getting within 8-4 through one full inning as they closed the gap on the disastrous start. Errors piled up in a hurry for the Titans to start the 2nd inning as Laanan quickly found himself with another loaded bases for the Geckos. An error from 1st base allowed a GW run, and Jamanila notched an RBI single to take a 10-4 lead. Two more errors would put GW up 13-4, but a big slam from Gecko ‘Mighty’ Joe Young turned into a 2RBI double to put GW firmly ahead 15-4. Tiyan would again respond in the 2nd inning with Laanan and Lujan bringing in three totals runs for a 15-8 deficit. A balk would bring the score 15-9 before concluding the 24 runs scored in the first two innings. Defense dominated the third through 5th innings, but the Geckos made one last run to stay ahead for good. Young started the 6th inning with an RBI to go up 16-10, and two untimely errors put GW up 19-11 as Laanan made his exit for Tino Muna, who would pitch the last two innings for the Titans.